The South African government aims to reduce the country’s emissions by 34% below the Business-As-Usual (BAU) emission level till 2020 and by 42% till 2025. According to its intended nationally determined contribution (INDC) South Africa GHG emissions are projected to plateau between 2025 and 2035 followed by a decline till 2050. The transport sector is responsible for about 13% of the country`s total greenhouse gas (GHG) emissions and for 28% of the total energy consumption. Together with the Department of Transport (DOT) TRANSfer is developing a NAMA called “Tsamaya” which is the Setswanana word for “Go!”. The aim of the project is an up-scaling of integrated transport systems in cities based on the concept of eco-mobility through a national program approach. The support mechanism includes an improved legal and regulatory framework, assistance in project development as well as in financing for selected cities to bridge the gap from planning to implementation and monitoring of sustainable urban mobility measures. Emissions from the transport sector are rising continuously and are projected to increase significantly till 2050 without additional GHG mitigation measures. The national government is aware of the situation and puts the transport sector at the core of the flagship programmes under the National Climate Change Response White Paper. The Department of Transport (DOT) has an interest in steadily improving the transport efficiency and promote at the same time co-benefits. The TRANSfer project is run by GIZ and funded by the International Climate Initiative of the German Ministry for the Environment, Nature Conservation, Building and Nuclear Safety (BMUB). Its objective is to support developing countries to develop and implement climate change mitigation strategies in the transport sector, called „Nationally Appropriate Mitigation Actions“ (NAMAs). South Africa is promoting a modal shift towards public transport and non-motorised modes, as well as setting a framework for energy efficiency in transport. The activities complement the national and trans-sectoral plan to elaborate mitigation actions. Within the NAMA identification process the ‘Passenger Modal Shift from Road to Rail – The Gautrain Case’ has been chosen to be developed as NAMA for recognition. The Gautrain is an existing rapid rail network of around 80 km extension carrying around 42,000 passengers per day with expected increasing numbers of passengers in the coming years. It serves the important corridor from Johannesburg to Tshwane. TRANSfer supports especially the approach to measure, report and verify emissions reductions and co-benefits. In a second initiative TRANSfer is promoting the development of a CNG-NAMA. This includes the support of a conversion project in the minibus-sector as well as the improvement of the policy framework for natural gas in the transport sector in order to reduce GHG emissions from vehicles. 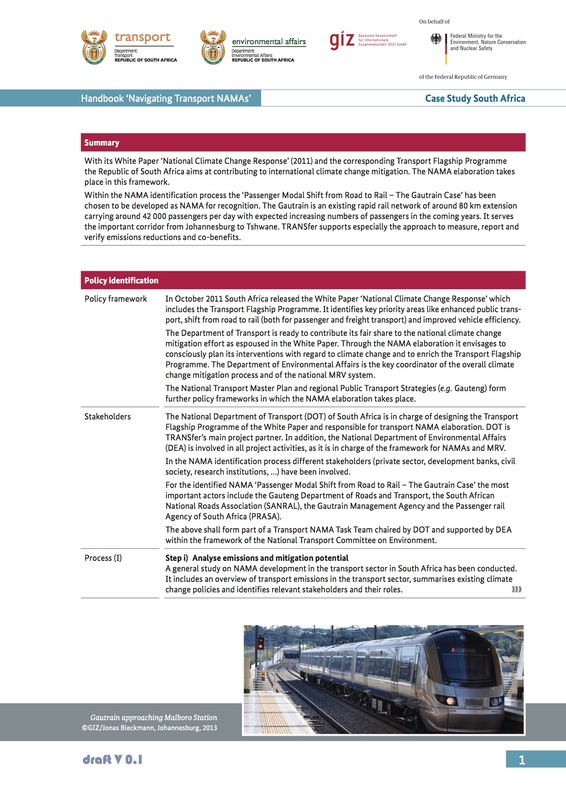 To quantify sustainable development benefits (social, economic, environmental) and the emissions reductions that occur due to the modal shift from road to rail at the example of the Gautrain. Both the Department of Transport (DOT) as well as the Department of Environmental Affairs (DEA) have an interest in steadily improving the transport efficiency and promote at the same time co-benefits. Besides the Gautrain NAMA has been implemented, we are currently jointly elaborating new mitigation potentials. The TRANSfer project is run by GIZ and funded by the International Climate Initiative of the German Ministry for the Environment, Nature Conservation and Nuclear Safety (BMU). Its objective is to support developing countries to develop and implement climate change mitigation strategies in the transport sector, called „Nationally Appropriate Mitigation Actions“ (NAMAs).